Yesterday we looked at the sobering topic of spousal abuse or domestic violence. We noted how it can be physical or non-physical and is far more common than we’d expect. It is something that Bible condemns and the very opposite of what it requires of husbands and wives. These two posts are a way for the elders to communicate our desire to see victims supported and abusers brought to repentance. The complexity and nature of these issues mean that we can only scratch the surface. There are some resources below if you want to explore the issues further. In this post we want to consider the response of the church to marriages where oppression and violence are part of the pattern of relationship. It is common when thinking about our marriage or the conflicts that others are having to keep in mind that both people are likely contributing to the conflict. One spouse might speak the first harsh word, but the other spouse then chooses to respond poorly and pretty soon is a boxing match of verbal nastiness. At such times, both parties need to calm down and consider how they are sinning and repent accordingly. Much of the time the two, while not equal contributors to the conflict, are likely contributors nonetheless. This is a good approach for most situations. But when abuse has entered the relationship, the scenario is radically different. It is not a situation with two equal parties. One spouse really is what the Bible would call an “oppressor,” the other is the victim. “Victim” is not a statement of total sinlessness in every area of life, only that in this situation they are simply not the cause of the abuse and are reaping horrible consequences from that abuse. The oppressor needs justice and the stern love of the church; the victim needs protection, comfort, and compassion. The Bible speaks harsh words to those in positions of power who take advantage of those weaker: “Cursed be anyone who perverts the justice due to the sojourner, the fatherless, and the widow” (Deut 27:19; cf. Mal 3:5). “Reviling” or verbal abuse is actually one of the sins that can lead to excommunication from the church (1 Cor 5:11). And the Bible also makes great promises to those who will defend the cause of the weak. If we will “loose the bonds of wickedness” and “let the oppressed go free,” the Lord promises “then shall your light break forth like the dawn, and your healing shall spring up speedily” (Isa 58:6, 8). 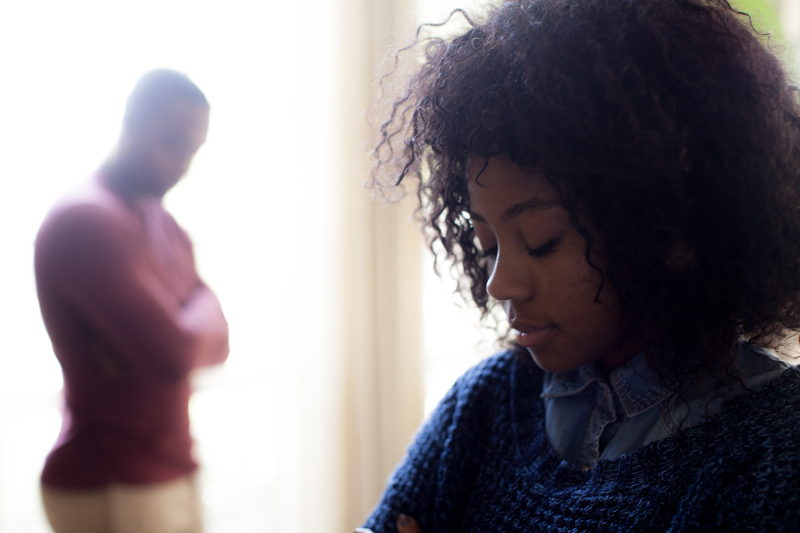 In an abusive relationship, there are many issues that require skillful attention from a team of people. On one side of this is the abuser who must repent. This is no easy matter since the behaviors are likely the overflow of a heart with long-entrenched patterns of sin, selfishness, and a lack of self-awareness. Chris Mole’s book The Heart of Domestic Abuse is a useful resource on this issue. The abuser’s behavior might require the involvement of the church (perhaps even church discipline), the civil authorities, and other concerned friends and family. There are support groups for men who struggle with this kind of a lack of love and self-control. On the other side is the victim, the one being abused. The victim needs care at a variety of levels from the emotional support of friends to practical needs to legal counself to spiritual guidance. Friends, family, pastors, a church, and perhaps a support group might all have a place in caring for the one abused. The best scenarios are ones where the team of helpers is working together, but this is not always possible. The church can serve a variety of roles with a couple in crisis. One of these involves its spiritual authority. In certain cases the church might need to exercise its authority through the process of church discipline and potentially excommunication. The apostle Paul writes that if some “bears the name of brother” but “is a reviler” (verbally abusive), the church must “not associate with” that person or “even eat with such a one” (1 Cor 5:11). But the church’s authority is not the only authority. The civil government possesses what the Bible calls “the sword” to punish evil and reward the good (Rom 13:1–4). “The sword” means the government has the authority to physically punish a person through its courts and law enforcement agencies. This reminds us that sometimes the oppression is not just sinful but criminal. As an oppressed spouse in these cases, your first call might not be to a pastor or friend but to the police. In an ideal situation, the police, the church, and any counselors involved are all part of the same team working on behalf of the couple and especially the victim of abuse. One thing to know that is different between child abuse and spouse abuse is that the law puts different obligations on others in these two scenarios. A person who knows about or suspects child abuse might be obligated under the law to report this to the authorities. In Wake County this means a call to Child Protective Services Report Line at 919-212-7990 or simply call 9-1-1. But under NC law, domestic violence puts more of the onus on the spouse being abused. Others may call the police but not legally obligated to. The law assumes that an adult has the ability and responsibility to notify the authorities herself/himself. There is a protective side to this. A well-meaning call to the authorities by another adult might result in great harm to the spouse being abused. Sometimes it takes a carefully planned strategy to report abuse in such a way that things aren’t made worse for the victim. A ministry like InterAct (https://interactofwake.org/, 866-291-0855) can be extremely helpful with this. Lord willing, your marriage and the marriages of those you love will never decline into such oppressive patterns of relating. But if it does happen, please get help. These are not issues we can handle on our own. If you do find yourself in such a place of need, may the Lord meet you with all that is required to find life, strength, and help.